This is the beginning of Libba Bray's award-winning book, Going Bovine. The rest is just as funny and raw as the first line. It introduces Cameron, an underachiever who only wants to get through life unscathed. The story is told through his eyes and nothing is left out. Then he meets Dulcie, a punk angel who tells him that he needs to go on a mission, where, if he succeeds, he will be cured. So off he goes to save the world, find a cure, and figure out the purpose of Gonzo, a dwarf obsessed with video games. 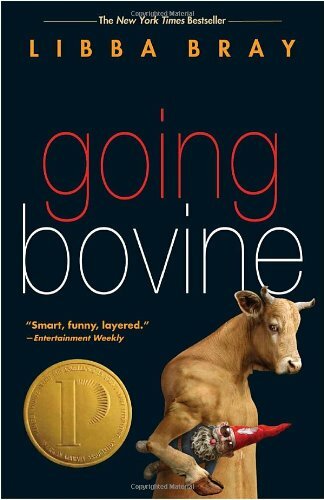 As the 2010 Printz winner (for excellence in young adult literature) Going Bovine truly deserves this award. It strikes a chord of familiarity and adventure and provides real insight into the mind of a 16-year-old “dude.” It makes you laugh, cry, and want to go to New Orleans just as much as it makes you think. You develop a desire to live life to its fullest. Fantastic imagery and emotion make Going Bovine an amazing book. The details make the scenes and characters leap off the page. You either really want to be friends with them or know that if you actually knew them you would despise being in their company. It's impossible not to want to read until, excuse the pun, the cows come home! Providing hours of laughter and moments of sadness, it is one of those books that you will pull out just to see what the heck it's about and then end up bringing to dinner to read. People who enjoyed the previous works of Libba Bray (The Gemma Doyle series) will not be disappointed by this unique and strange work of fiction. Although very different, this book uses incredible characterization, dialogue, and plots that always make her books fascinating. Wow! Great review! My book club was going to read this book and I wasn't so sure I would like it but after reading your review I totally want to read it! You've done an amazing job! Keep it up! This really is worthy to be published. Great job. Keep it up.